Never let an offer die is one of my rules as a real estate broker. Whether I am making an offer on behalf of a buyer, or receiving an offer from another real estate agent on a listing, I never let an offer die. This is incredibly important for you as a buyer or as a seller, and let me explain exactly why. I represented a buyer who asked me to draft an offer on a nice home. I did, and I submitted the offer to the listing agent. When I submit an offer, I scan it and email it to the listing agent, and then I call the listing agent immediately to let him or her know it is in their inbox. After three days of no news and no response from the listing agent, both my client and I were getting impatient. Finally, on the 3rd day the listing agent emailed me to let me know that the sellers chose on the first day not to respond to the offer at all. This is a text book example of how not to handle an offer on the seller’s end. But had the seller and their agent applied this simple rule, Never Let An Offer Die, there would have been a counteroffer, and we would have reached an agreement. How do I know we would have reached an agreement? Because my client and I applied the rule, Never Let An Offer Die, and we re-submitted the offer and forced the seller and their agent to respond until we finally did reach mutual acceptance. 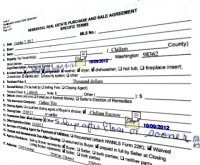 Had we not applied this rule, the seller would not have sold their home to this buyer. I drafted and submitted another offer for a client from Texas. The listing agent did not acknowledge receipt of the offer, and did not respond to repeated phone calls and emails. Weeks went by. Nothing. Finally I reached the listing agent on the phone, and we had a conversation about the property and whether the seller will respond. I was reassured that the seller will respond. I drafted a new offer and submitted that to the same agent on the same house. Nothing. As a buyer’s agent, I am prohibited from contacting the seller directly. Apparently my client will not be able to buy that house, although I am certain the seller wants to sell. Again, if the rule, Never Let An Offer Die, had been applied by the listing agent, we might have closed that transaction. If these were two isolated examples of the rule not being applied, it wouldn’t be so bad, but they are not. I drafted and submitted an offer on a listing that was overpriced, and the listing agent told me that his client was not even going to respond. It was a short conversation, because he then said, “Goodbye.” No counteroffer. Nothing. That was a little over two years ago. Today that house is still on the market and the listing price is now down to what my client originally offered. I understand if sellers don’t know about my rule, Never Let An Offer Die, but real estate agents should know and practice this rule for the benefit of their own clients. Of course, they would also earn a commission is they practiced the rule. The logic of the rule becomes apparent when you think about what it takes to get one interested and qualified buyer who wants to make an offer on a home in the worst real estate recession I’ve seen in over three decades in the business. Walking away from that one buyer who may come along once in six months would be crazy. In this market, and frankly in any market, when you have a serious buyer and and serious seller, not making an effort to reach mutual acceptance is just plain foolish. If you had a car advertised for sale for $4,000 on Craigslist, and someone called you and asked you if you would consider $3,750, would you hang up on them? Of course not. If you were selling a home listed for $400,000, and someone offered $375,000, would you not even respond to the offer? You can see why I place so much emphasis on this rule, Never Let an Offer Die. Practicing this rule does not guarantee that you will reach mutual acceptance, but it does substantially increase the chances of closing the deal. It’s a simple rule, but it is one of the most powerful and effective negotiating rules on the table. I have written elsewhere that negotiating real estate is not like handling a garage sale. There is much more to negotiating than most people realize. Some of the negotiating rules are simple, like this one. I strongly recommend that you Never Let An Offer Die. One Response for "Never Let an Offer Die"
I can completely relate to this article. I can’t tell you how many times I have encountered an unmotivated seller / seller agent who never responds or is unreliable throughout the entire process. If everyone practiced this simple rule, the entire process of buying and selling would be almost headache free and smooth. Thank you for sharing this article and hopefully many will see this and apply it to not only real estate but throughout their whole life as well.